Increasingly governments are looking for new and more impactful ways to communicate with citizens. There is a slow but growing awareness that traditional sources of outreach, such as TV stories and newspaper advertisements are either not reaching a significant portion of the population and/or have little impact on raising awareness of a given issue. The exciting thing about this is that there is some real innovation taking place in governments as they grapple with this challenge. This blog post will look at one example from Canada and talk about why the innovation pioneered to date – while a worthy effort – falls far short of its potential. Specifically, I’m going to talk about how when governments share data, even when they use new technologies, they remain stuck in a government-centric approach that limits effectiveness. The real impact of new technology won’t come until governments begin to think more radically in terms of citizen-centric approaches. The dilemma around reaching citizens is probably felt most acutely in areas where there is a greater sense of urgency around the information – like, say, in issues relating to health and safety. Consequently, in Canada, it is perhaps not surprising to see that some of the more innovative outreach work has thus been pioneered by the national agency responsible for many of these issues, Health Canada. 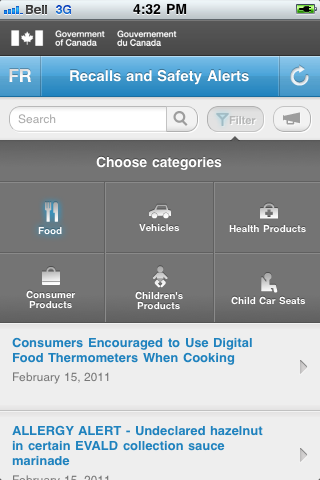 The most cutting edge stuff I’ve seen is an effort by Health Canada to share advisories from Health Canada, Transport Canada and the Canadian Food Inspection Agency via three vehicles: an RSS feed, a mobile app available for Blackberry, iPhone (pictured far right) and Android, and finally as a widget (pictured near right) that anyone can install into their blog. I think all of these are interesting ideas and have much to commend them. It is great to see information of a similar type, from three different agencies, being shared through a single vehicle – this is definitely a step forward from a user’s perspective. It’s also nice to see the government experiment with different vehicles for delivery (mobile and other parties’ websites). The problem isn’t about access: These tools are predicated on the idea that the problem to conveying this information is about access to the information. It isn’t. The truth is, people don’t care. We can debate about whether they should care but the fact of the matter is, they don’t. Most people won’t pay attention to a product recall until someone dies. In this regard these tools are simply the modern day version of newspaper ads, which, historically, very few people actually paid attention to. We just couldn’t measure it, so we pretended like people read them. The content misses the mark: Scrape a little deeper on these tools and you’ll notice something. They are all, in essence, press releases. All of these tools, the RSS feed, blog widget and mobile apps, are simply designed to deliver a marginally repackaged press release. Given that people tuned out of newspaper ads, pushing these ads onto them in another device will likely have a limited impact. As a result, I suspect that those likely to pay attention to these innovations were probably those who were already paying attention. This is okay and even laudable. There is a small segment of people for whom these applications reduce the transactions costs of access. However, with regard to expanding the numbers of Canadians impacted my this information or changing behaviour in a broader sense, these tools have limited impact. To be blunt, no one is checking a mobile application before they buy a product, nor are they reading these types of widgets in a blog, nor is anyone subscribing to an RSS feed of recalls and safety warnings. Those who are, are either being paid to do so (it is a requirement of their job) or are fairly obsessive. In short, this is a government-centric solution – it seeks to share information the government has, in a context that makes sense to government – it is not citizen-centric, sharing the information in a form that matters to citizens or relevant parties, in a context that makes sense to them. Again, I want to state while I draw this conclusion I still applaud the people at Health Canada. At least they are trying to do something innovative and creative with their data and information. So what would a citizen-centric approach look like? Interestingly, it would involve trying to reach out to citizens directly. People are wrestling with a tsunami of information. We can’t simply broadcast them with information, nor can we expect them to consult a resource every time they are going to make a purchase. What would make this data far more useful would be to structure it so that others could incorporate it into software and applications that could shape people’s behaviors and/or deliver the information in the right context. The product name, size and better still the UPC and LOT codes. However, all this information is buried in the text so is hard to parse and reuse. Retailers could connect the bar code scanners they use on their shop floors to this data stream. If any cashier swipes this product at a check out counter they would be immediately notified and would prevent the product from being purchased. This we could do today and would be, in my mind, of high value – reducing the time and costs it takes to notify retailers as well as potentially saving lives. Mobile applications like RedLaser, which people use to scan bar codes and compare product prices could use this data to notify the user that the product they are looking at has been recalled. Apps like RedLaser still have a small user base, but they are growing. Probably not a game changer, but at least context sensitive. I could install a widget in my browser that, every time I’m on a website that displays that UPC and/or Lot code would notify me that I should not buy that product and that it’s been recalled. Here the potential is significant, especially as people buy more and more goods over the web. As we move towards having “smart” refrigerators that scan the RFID chips on products to determine what is in the fridge, they could simply notify me via a text message that I need to throw out my jar of Tahini of Sesame. This is a next generation use, but the government would be pushing private sector innovation in the space by providing the necessary and useful data. Every retailer is going to want to sell a “smart” fridge that doubles as a “safe” fridge, telling you when you’ve got a recalled item in it. Another advantage of this approach is that it also gets the Government out of the business of trying to find ways to determine the best and most helpful way to share information. This appears to be a problem the UK government is also interested in solving. Richard A. sent me this excellent link in which a UK government agency appeals to the country’s developers to help imagine how it can better share information not unlike that being broadcast by Health Canada. However, at the end of the day even this British example falls into the same problem – believing that the information is most helpfully shared through an app. The real benefit of this type of information (and open data in general) won’t be when you can create a single application with it, but when you can embed the information into systems and processes so that it can notify the right person at the right time. That’s the challenge: abandoning a broadcast mentality and making things available for multiple contexts and easily embeddable. It’s a big culture shift, but for any government interested in truly exploring citizen-centric approach, it’s the key to success. This entry was posted in canadian politics, open data, public policy and tagged gov20, health canada, opendata, public policy, social media on February 18, 2011 by David Eaves. I think that this is a great article in that it provides some good examples and rationale for Health Canada specifically and Governments in general to re-think their communication strategy. But I don’t think it goes far enough. Unless I am mistaken, your proposed model presents a one-way communication flow from a government via developers (through an API perhaps) to citizens through a variety of interfaces. I think there is a great potential to re-image the traditional communication flow altogether. What would it look like to close the loop and open governments up to meaningful exchanges of information where citizens, through innovative and easy to use interfaces, were to communicate back to governments. For instance, in geography, it is commonly understood that citizens are experts of their own geography. This is being utilized through Open 311 as a tool to fix problems like potholes and broken sidewalks. Interesting but shallow application of a powerful concept. I would be interested in seeing how an urban planning application might role out where citizens could collaborate in an open map space to redevelop their communities. An on-line asynchronous non-time limited charette. Or, alternatively, apply those same ideas to health and understand that if you are sick you probably have some understanding of your illness. Using the GeoWeb it is possible to document where you have lived in your lifetime, and include the when and where you got sick. This can be accomplished with a secure degree of privacy through tools at aggregate data to a wide geographic area (postal code, riding). Both of these examples would provide some great data for governments, and also some communication challenges that may spur some additional engagement between citizens and their governments.